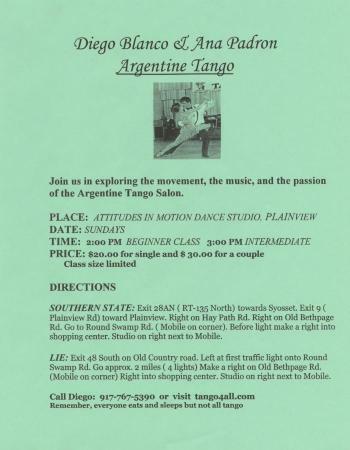 Argentine Tango Lovers of Long Island flyer, advertising tango class with Diego Blanco and Ana Padron, ca. 2005.;The Argentine Tango Lovers of Long Island, offering dance lessons, tango parties and performances, began in 2004 with Sherry Palencia as president and Carmen Quintero as vice president. Source: Hofstra University. Hispanic/Latino Collection, 1951-2008. Box 1, Folder 19.